One of the concepts I truly believe in is that you must continue working on important elements of the curriculum all year around. 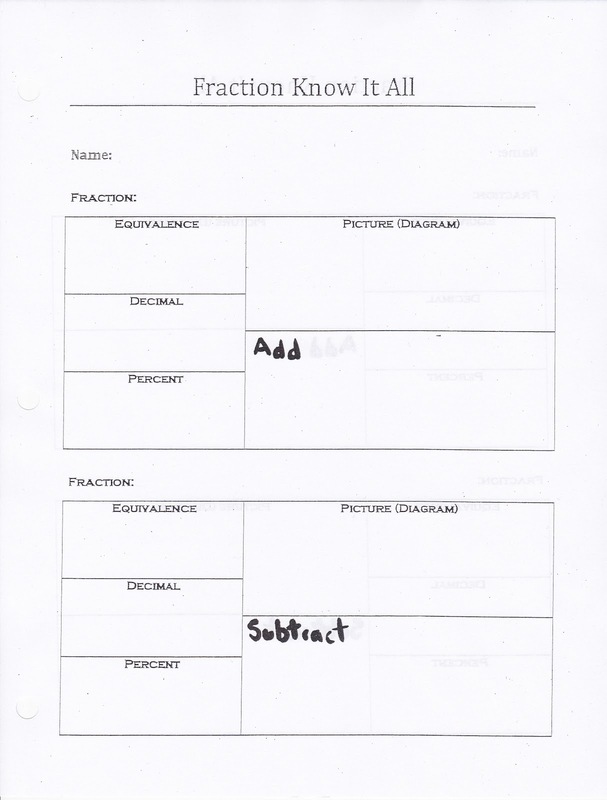 Working on a unit in math such as fractions at the beginning of the year and then not really focusing on it again until the next year can really bring about difficulties for the students. 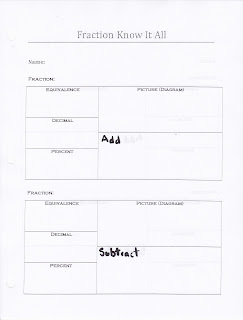 That instant recall after not seeing it for a long time is almost impossible for many students. One of the things that I have tried to bring to my math class is responsibility for all math concepts at any time. Even though we go through units with specific math themes we also try to work on all the math concepts all year as well. The way I accomplish this is through the opening minutes of the class. The warm-up or sponge activity when the students come through the door. Each day has some kind of different theme. The following is what my students get every Monday morning when they enter the class. 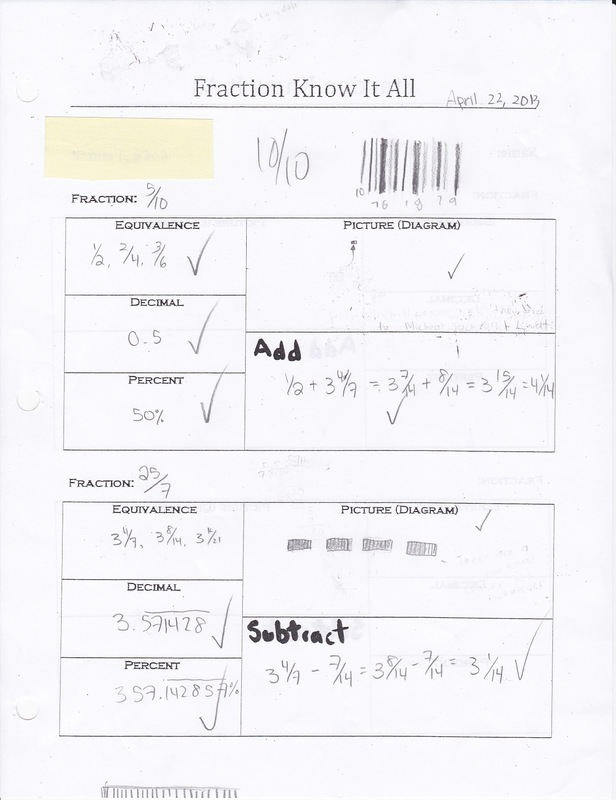 It is the Fraction Know-It-All and it basically goes over many of the important elements of understanding fractions, decimals and percents and how they are connected. At the beginning of the year it takes a little bit of time to teach but because I know that we are going to continue this all year I don't feel the pressure to explain everything all at once. 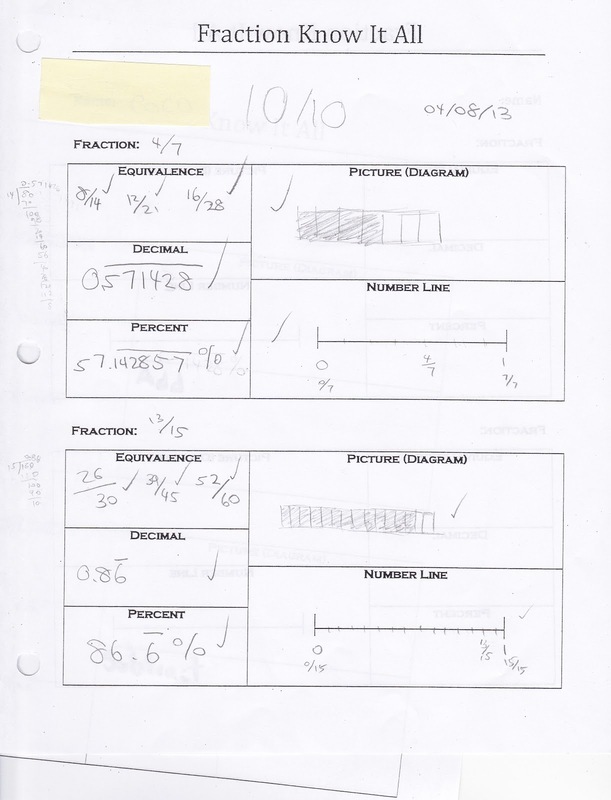 I have the students show 3 equivalent fractions, the decimal, the percent, draw a diagram of what it should look like and place it on a number line. 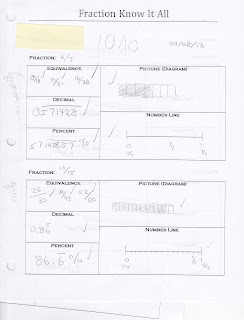 I put a student's example below so that you can see the basic results. I have them do 2 different fractions at a time. I start with some simple fractions but it grows as the year goes on. 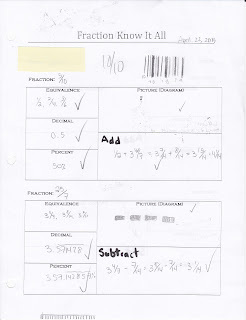 I am able to cover improper fractions and mixed numbers, repeating and terminating and anything else that is included with fractions, decimals and percents. It also gives me weekly feedback on what students are struggling and where. 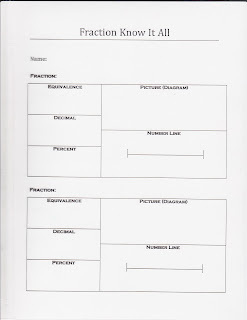 I usually don't even have a standard fractions unit because we do this each Monday. I give the students a fraction quiz at about the half way point in the year and small mini pop quizzes when I feel it necessary. What I have found is that the students do extremely well on the quizzes even though they don't have a warning or study for it. 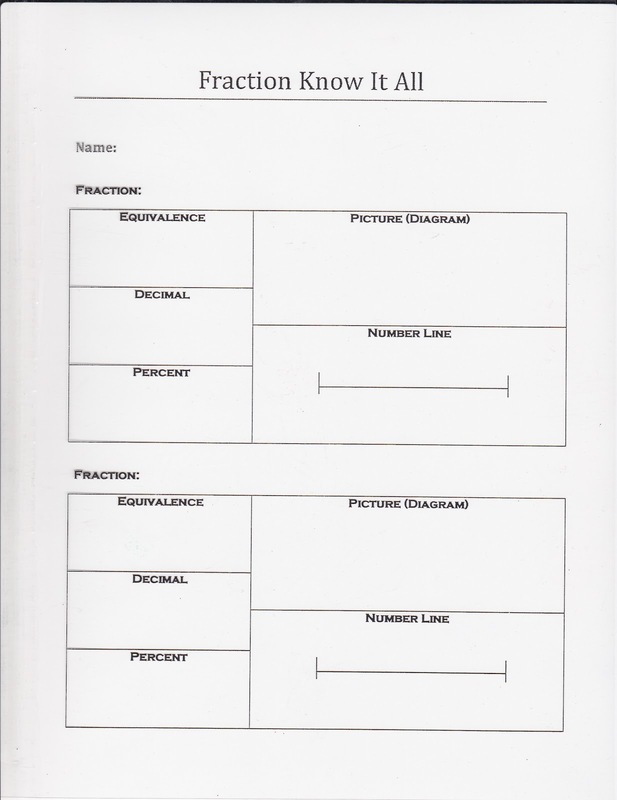 I have these sheets as Word documents if you would like them, send me an email or comment and I will get them to you.